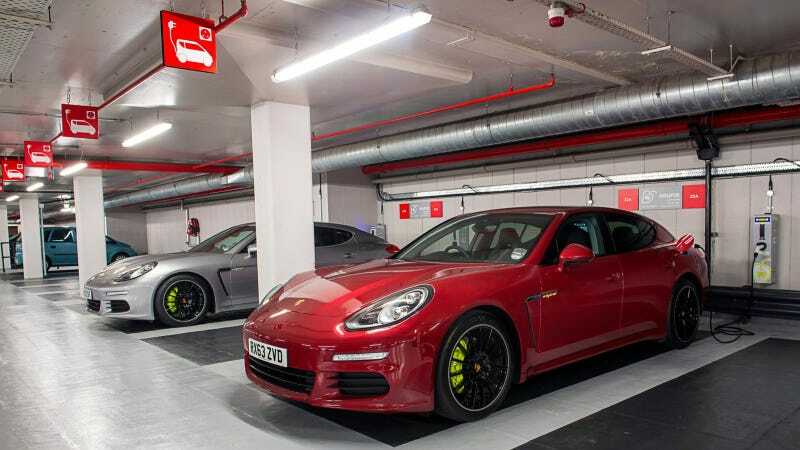 The new Porsche Panamera S E-Hybrid, the world's first plug-in hybrid for the executive saloon class, has gained OLEV (Office for Low Emission Vehicles) Grant approval. Only a select handful of cars qualify for the Government-backed scheme, which entitles customers of qualifying ULEV (Ultra-Low Emission Vehicles) models to a 25% grant towards the cost of the car, up to a maximum of £5,000. Running since January 2011, the grant is designed to encourage vehicle manufacturers to develop electric and green technologies for market, and to help customers invest in 'green' automotive technologies. Utilising a 3.0-litre V6 engine teamed with a newly-developed lithium-ion battery and electric motor, the Panamera S E-Hybrid is a four-door, four-seat sports car that is first and foremost a Porsche. That means that performance, power and driver-focussed dynamics are an intrinsic part of the newcomer's character, yet its official economy and CO2 figures stand at just 91 mpg and 71 g/km respectively. The S E-Hybrid is capable of running purely on electric power for emission-free driving and zero petrol consumption for up to 22 miles (subject to driving style and conditions) and can reach speeds of up to 84 mph in this mode. Building on the Porsche full hybrid platform, the Panamera S E-Hybrid is a systematically advanced development of the proven Porsche parallel full hybrid, with a more powerful electric motor, a higher-performance battery that supplies more energy, while also having the ability to be recharged externally from the electrical grid. The electric drive produces 95 hp (70 kW), which is more than double the power of the previous Panamera Hybrid 47 hp (34 kW) electric motor. It draws energy from a new lithium-ion battery, which at 9.4 kWh has over five times the 1.7 kWh energy capacity of the previous (nickel metal hydride) battery technology. When connected to an industrial outlet, it can be charged within around two and a half hours via the integrated on-board charger and the standard Porsche Universal Charger (AC). It can be charged in less than four hours when connected to a conventional household electrical outlet. The Panamera S E-Hybrid can reach speeds of up to 84 mph in all-electric operation, and the acceleration time from 0-62 mph has been shortened by half a second to 5.5 seconds. The electric boost function helps here, in which the performance of the electric motor aids that of the combustion engine. Boosting can also be activated by kick-down – such as when overtaking. The car's overall top speed is 167 mph. The parallel full hybrid concept developed by Porsche also offers 'coasting' at higher speeds, which refers to free coasting with the internal combustion engine shut off and generating electricity by energy recovery. The majority of Panamera models feature the seven-speed Porsche Doppelkupplung PDK dual-clutch transmission. The eight-speed Tiptronic S automatic is used in the Panamera Diesel and Panamera S E-Hybrid, which creates optimal conditions for further development of other efficiency functions. For example, the extended start-stop function now deactivates the engine earlier while coasting to a stop, which saves even more fuel. At Porsche, plug-in hybrid technology will not remain the sole preserve of the Panamera S E-Hybrid. The technically remarkable and pioneering super sports car, the 918 Spyder, which is now on sale with first deliveries in the UK next year, also utilises this powertrain system in order to deliver ultimate levels of performance. Boasting 887 hp from the combination of a race-bred V8 petrol engine and two electric motors, the fastest road-going Porsche to date is capable of catapulting from rest to 62 mph in 2.6 seconds and on to a top speed of 214 mph. And yet it is also the Porsche with the lowest emissions, with official figures of just 70 g/km of CO2 and fuel economy of 94 mpg (all data for Weissach package specification). Clearly, with the capability of delivering the high levels of performance expected from Porsche along with highly unexpected ultra-low emissions and low fuel consumption, there will be further plug-in hybrid developments from Porsche in the future.